In depth coverage for anyone who really wants to know the subject. 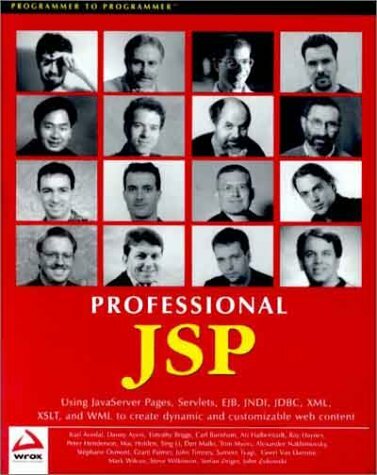 Until fairly recently I was not convinced of the validity of JSP technologies. My problem was that JSP's allow you to mix up code within HTML. The creation of presentation and the programming of logic require very different skill sets and mixing the two can cause problems. The more I have come to understand JSP the more I realise how important it is. When used properly it allows designers access to functionality created by programmers without them having to learn to program, it can help the separation of logic from appearance. In some ways learning the JSP technologies is more complex than learning servlets, as you have another layer of abstraction when your JSP code is turned into servlet code "behind the scenes". This book has 891 pages including index and has 16 authors listed (with photos on the front cover). The only author I had heard of before was John Zukowski (get a new photo John), a well respected author of Java books. An advantage of the the team approach is that the material is all relatively up to date which is very important in an area like JSP. A year ago it was hard to find any support or tools for JSP programming, standards had only just started to settle down and the vendors had just started to bring out tools. It doesn't come with a CD which I don't consider a drawback as a CD seems to significantly put up the price of technical books. You can download the source code from the Wrox web site. This is not JSP for Dummies, don't pick it up unless are already a competent Java programmer. By page 30 the books is showing you the Java servlet code generated by the JSP engine. You might regard this as too much detail, but that is the code that is running in your JVM, and understanding that code allows you a greater understanding of the whole process. On browsing the topics I initially jumped to chapter 10 debugging JSP. This is an excellent coverage of generic problems that can occur in JSP code. Because JSP code gets converted to servlet code before compilation it can be hard to track down trivial errors This chapter gives advice such as locating the generated servlet and then using a debugger to step through that code to locate problems. Appendix A covers configuring Apache and Tomcat, as Tomcat is now the reference implementation of JSP technology this is probably worth a place as a chapter rather than an Appendix. As Tomcat is freely available it is a good bet that most newcomers to the technology will be using it and that other tools vendors will generally ensure that they conform to the Tomcat standards such as XML configuration files. Chapter 8 covers the Tag extensions and Libraries. This is a relatively new technology introduced in JSP 1.1, and there is very little printed literature available on it at the moment. The Tag system allows you to extend the tags that can be embedded in a JSP page and means you can further divide up the work off creating an interactive web site between the designers and the programmers. Where I work we have adopted the Tag system wholesale as part of our web framework and if you do a search on the web you will find people working like crazy to create Tag library systems. The chapter covers 20 pages, which illustrates the depth that can be given to a topic in a book of this size. This book goes well beyond the basics. I like authors to tell me about their problems as well as their triumphs. This is illustrated in Chapter 14 the photography database case study. The author mentions a problem he had when attempting to do low level manipulation of jpg files. The classes required are only available if a GUI is loaded. Of course, under windows this never a problem, but under Linux the OS can be started without the Xwindows GUI. The author goes on to explain how to use this type of code with either MySQL or Postgres, databases available for my favourite price (free) and made available by many ISP's. Some of the newly breaking technologies covered by the book are XSLT,JNDI, custom tags, multimedia streaming and WAP. These are such new technologies that there are very few books available at the moment that cover them (and most of them are from Wrox). In depth writing by people who know the subject referring to up to date technologies. Lot's of examples using a wide range of technologies. It's a big in-depth resource with lots of code and example case studies. I'd rather the size of the book was trimmed a little, even for an in-depth book. I don't think the chapter on porting ASP to JSP will appeal to many readers and the inclusion of the JSP and servlet API reference seems like unnecessary padding. Yes, it covers the subject in depth and is well worth the money. I'm keen to see what the next update brings, especially as new JSP related tools become available. I still keep referring to it and going over the examples.